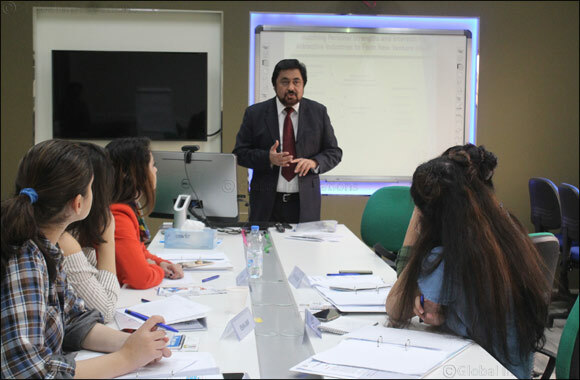 Dubai, UAE, January 29, 2018: Skyline University College Centre for Continuing Learning (CCL) has successfully awarded the Certificate Program in Entrepreneurship and Emerging Trends in Information Technology to GIFT University, Pakistan students after completing a three-day Boot Camp at SUC from January 16-18, 2018. The Boot Camp that consisted of lectures, workshops, and presentations covered the most relevant topics of today such as: Concept of Entrepreneurship, Destinations in UAE, Social Media Platforms in Business and Block Chain, Identifying Opportunities, Concept and Functionalities of a Business Plan, and Emerging Trends in IT. The speakers and lecturers were Head of Academics-School of Business and Associate Professor, Dr. Ajith Kumar; Head of Academics-School of IT and Associate Professor, Dr. Deepak Kalra; Associate Professor, Dr. Mohit Vij; Assistant Professor, Dr. Kakul Agha; and Lecturer, Dr. Taleb Bilal Eli. SUC Founder President Mr. Kamal Puri also took the time to visit the class during one of its sessions and personally greeted and delivered some words of wisdom to the students. Part of the participants’ itinerary were visits to some of the popular destinations in the UAE such as Burj Khalifa and Dubai Mall and a chance to experience Desert Safari and Dhow Cruise. Certificate Program in Entrepreneurship and Emerging Trends in Information Technology is designed primarily to provide an overview of entrepreneurship, develop an entrepreneurial frame of mind and have an insight of the emerging trends in Information Technology. The role of entrepreneurship in an economy is of interest to businesses, government, academicians, and students. Creating and growing a new venture is a task that a few individuals are able to accomplish, even though many profess the desire. Over the past few decades, Information Technology radically reshaped and transformed the way organizations work. It had impacted all aspects of human life and business. In this context, it is essential to have an orientation of the current trends in Information Technology like cloud computing, data analytics, data architecture, social media platforms, enterprise resource planning, and many more. This will help in using the current and latest trends in designing various systems and process for any organization, which will help in developing competitive advantage over their competitors.